May 02, 2017: An uncle was getting rid of some Infinity Reference 2000.4 and I just made the mistake of buying an amp before finding a reddit.. How'd I do? May 27, 2017: Another day, another suggestion about a speaker I just saw for the first time. Jul 07, 2017: A buzzing sound from speakers when connected to computer. Jul 17, 2017: How do you connect a Fiio D3 dac to my JBL 305's? Jan 19, 2018: Is there anything I should know about DACs before purchasing one? Feb 12, 2018: Looking for the simplest, cheapest way to take a usb digital output and convert to 1/4" line level. Apr 04, 2018: [Help] No sound passing through DAC. Did I purchase the wrong equipment? Apr 04, 2018: No sound passing through DAC. Did I purchase the wrong equipment? Oct 07, 2018: Fix Audio Lag on Vocals, Does this method really works? Nov 29, 2018: Anyway to convert OPTICAL to USB Audio for Outlaw RR2150? Dec 08, 2018: I’m wanting to get new speaker for my TV. Dec 20, 2018: Finally have a setup of my very own! Jan 30, 2019: Desktop amplifier with spdif? 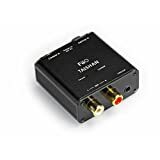 Apr 06, 2019: Does the Fiio E10k or any other amp work work on theps4 pro?